I love the holidays for many reasons, but the opportunity to get together with friends (and enjoy festive drinks like hot mulled cider and eggnog) happens to be close to the top. Unfortunately, by the time you actually get to Christmas, you might be all holiday’d out with the wine, cider and eggnog. 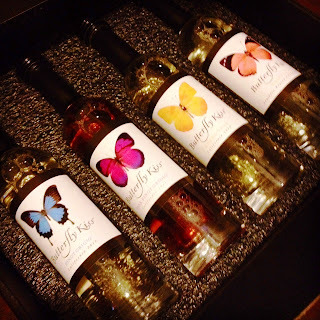 However, when a lovely delivery of new wines called Butterfly Kiss by Jason Dade arrived on my doorstep and could actually be used to create some new fun “signature” cocktails for an upcoming girls’ get together, I was pretty stoked to try them out. I was also excited to use with my marshmallow-flavored vodka gathering dust. 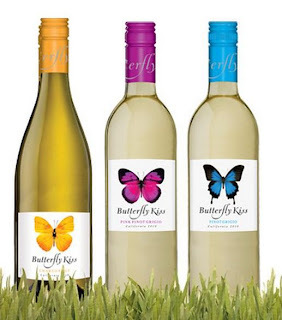 So to celebrate Friday and the holidays here are a few cocktail recipes for you to try with your girls using Butterfly Kiss Pinot Grigio or Pink Pinot Grigio (which I’m personally excited to taste!) Of course you can use any of your favorite wine varietals, but Butterfly Kiss was used specifically to create the perfect cocktail flavor. Build in a wine glass over ice. Stir. Build in a wine glass over ice. Squeeze lime wedges on top. Stir. Build in a pitcher over ice. Serves 8. Build in a glass over ice. Stir. wherever you purchase your wine and spirits. Ho! Ho! Ho! Clink. Clink! Clink! * Printed with permission by Butterfly Kiss.